First Place - "Boogie Man Jam"
First Place - "Barking and Clawing Against a Sensible Leash"
Second Place - "The Art of Christmas"
Honorable Mention - "Rear View Mirror"
First Place - "Snooping Stanley"
First Place - "She Leaves Us, A Little at a Time"
First Place - "Westward Sail"
Honorable Mention - "Cyber Ghoul"
Honorable Mention - " Quick Silver"
First Place - "Streamlined Credit"
Third Place - "Choose Your Struggles"
Second Place - "Raspberry Gummies"
Third Place - "Pink Noise"
Honorable Mention - "Westward Sail"
First Place - "Roadrunner Rhyme"
Inspirational, Second Place - "Mercy Waits"
Poetry, Honorable Mention - "Ella Rose Sees The Moon"
Children's ages 3-8, First Place - "Three Wishes"
Inspirational, Second Place - "Valentine's Day"
Children's ages 3-8, First Place - "Busy Day"
Haiku Series Award - First Place for "gray clouds dull the sky"
Second Place - "Dormant Volcano"
3rd Honorable Mention - "A View of Concrete Ribbons"
July, 2013 - in Juvenile Fiction, First Place for "The Twelve Gifts of Christmas"
Honorable Mention for "Rear View Mirror"
Honorable Mention for " My Grandmother's House"
Second Place for "The Second Christmas"
First Place Award of Distinction for "Earth"
Fourth Place Award of Valor for "Cactus"
Fourth Place Award of Valor for "Heaven"
Fourth Place Award of Valor for "Jazz Band"
First Place in Poetry Division - "Los Compadres"
Third Place for "Johnny Weissmueller as Tarzan"
Second Honorable Mention for "Love Does the Hard Things"
First Place for "Farmers Market"
Second Honorable Mention for "Sweet Fellowship"
Third Honorable Mention for "Render Unto Caesar"
Third Place for "Crop Rotation"
Honorable Mention for "Los Compadres"
First Place for "Love Does the Hard Things"
Honorable Mention for "My Grandmother's House"
Third Place - "My Grandmother's House"
First Place for "A View of Concrete Ribbons"
Haiku Contest, Honorable Mention - "Blue Jeans"
Humorous Poetry, Honorable Mention - "Me"
Viola Payne Children's Stories Award Highest Rank for Children Under 12 for Boogie Man Jam. Second Place for "Rear View Mirror"
April, 2012 - First Place for "raindrops chatter"
In the Humor story category - Honorable Mention for "Skinny Munchies"
In the Fiction category - First Place for "The Letter"
First Place for "I Can Never Move"
Third Place for "Los Compadres"
1st Honorable Mention for "It Must Have Been a Full Moon"
3rd Honorable Mention for "How to Make it Rain"
Third Place for "DNA Model"
First Honorable Mention for "Summer Fruit"
First Place for "Watch Where You Step"
First Place for "Lilah Belle's Busy Day"
Third Place for "Barking and Clawing Against a Sensible Leash." First Place for "Prayer in Pubic School"
Third Place for "If Brother Lawrence Had Been Married"
Third Honorable Mention for "Secrets"
Second Honorable Mention for "Blackbird"
First Honorable Mention for "Widow's Walk"
Second Place for "The Widow's Mite"
Honorable Mention for "Watch Where You Step"
2nd Honorable Mention in the Haiku contest for "cat bats at the moth"
First Runner-Up - "New Tricks"
First Place for "Open Heart Surgery"
Third Place for "Who Will I Be?" Third Place for "Rear View Mirror"
Honorable Mention - "My Grandmother's House"
Third Place for "Westward Sail"
Award of Merit for "Open Heart Surgery"
Award of Merit for "The Kitchen Door"
First Place for "What Calls Me Back"
Second Place for "Watch Where You Step"
Third Place for "Today We Plant"
Third Place for "It Takes a Big Man"
Sixth Honorable Mention for "In Praise of Shade"
Second Honorable Mention for "Secrets"
First Honorable Mention for "Sail to California"
Sixth Honorable Mention for "My Grandmother's House"
Honorable Mention for "My Crazy Sister"
Second Place for "Widow's Walk"
First Place for "Summer Fruit"
First Place for "The End of Summer Garden"
Second Place for "Texas Drought"
Third Honorable Mention for "Open Heart Surgery"
First Place for "Watch Where You Step." Third Place for "Texas Hill Country Winters." First Place for "How to Make it Rain"
First Place for "Widow's Walk"
Second Place for Where's My Hug? First Place for "Spring Lovers"
Co-First Place for "Fresh Baked Bread"
Honorable Mention for "A Well Seasoned Life"
First Place for "Room 232"
Second Place for "She Leave us a Little at a Time,..."
First Honorable Mention for "Open Heart Surgery"
Second Honorable Mention for "My Grandmother's House"
Citation for "Watch Where You Step"
Eigth Place for "My Grandmother's House"
Fifth Place for "Room 232"
Fifth Place for "Love Does the Hard Things"
First Place - "Widow's Walk"
Second Honorable Mention for "Go Away and Come Back"
Third Honorable Mention for "The Widow's Mite"
Second Place for "How to Make it Rain"
Third Honorable Mention for "When Real Estate Falls From the Sky"
Honorable Mention for "Barking and Clawing Against a Sensible Leash"
Second Place for "The Grandchild"
Second Place for "Teacher in the Wild"
Third Place for "The Widow's Mite"
Second Honorable Mention for "The Daily Beagle"
Second Place - 5 poem collection: "She Leave Us, a Little at a Time"
Second Place - 5 poem collection: "Neighborhood Dogs"
"Love Does the Hard Things"
May, 2016 - Honorable Mention - "Summer Fruit"
First Place - "Los Compadres"
Third Place - "Room 232"
Third Place - "Rainbow's End"
First Place - "Alaskan Adventure"
Third Place - "Mercy Waits"
Fifth Place for "The Second Christmas"
Second Place for "Room 232"
First Place for "Rear View Mirror"
First Place in Children's Literature for "Boogie Man Jam"
Second Place in Poetry for "Cow Jumps Over the Moon"
Honorable Mention in Poetry for "Crop Rotation"
First Place in Children's Literature for "Lilah Belle's Busy Day"
Second Place for "Barking and Clawing Against a Sensible Leash"
First Place for "The Lord Gives and ..."
First Place for "Antarctica in July"
Special Recognition for "buffalo at rest"
Third Honorable Mention for "Roadrunner Rhyme"
Third Place for "The Second Christmas"
First Honorable Mention for "My Crazy Sister"
First Honorable Mention for "Spirit Lake, Iowa"
First Place for "Barking and Clawing Against a Sensible Leash"
Second Place - "Los Compadres"
Judges comments: "The irony and levity of a restaurant crew piling out of their work place into someone else's restaurant where one can find "laughter shaking the air like maracas" is the fresh stuff of which a well-written poem can bring readers into the experience." Second Place - "Crop Rotation"
Judges comments: "With fresh phrasing and strong visuals, this free verse poems will speak to most readers – and all of us who have had to adapt to changing lifestyles." 4th Honorable Mention - "Barking & Clawing Against a Sensible Leash"
Judges comments: "This story in free verse has a conversational tone, situations people can identify with, and insightful phrasing." 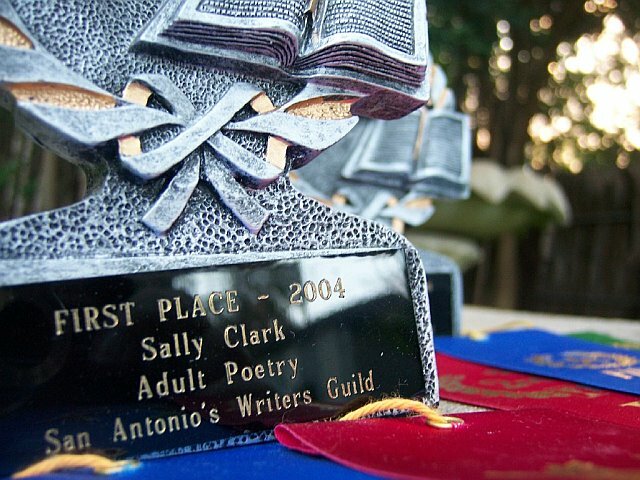 Most Promising - "How to Make it Rain"
Judges comments: " This free verse has strong reader identification and humor to deal with a common frustration." 6th Honorable Mention for "She Leaves Us a Little at a Time"
Judges comment: Creates an emotional impact from the first verse (actually, from the title) yet avoids sentimentality. April, 2003 - Poetry Contest, Honorable Mention - "Dickey"